Even with one perfectly hearing ear, it is important to understand the impact unilateral hearing loss can have on a child’s speech and language development, education, attention, self-esteem, and social interactions. ​Every now and then we see children in our clinic that have hearing loss in one ear; the severity of the loss can range from mild to profound. Approximately three out of every 1,000 children have been diagnosed with a unilateral hearing loss (AudiologyOnline, 2002). Even with one perfectly hearing ear, it is important to understand the impact unilateral hearing loss can have on a child’s speech and language development, education, attention, self-esteem, and social interactions. When a child with unilateral hearing loss is not hearing speech clearly, it is difficult for the brain to process proper speech cues and language format. Typically, the worse the severity of hearing loss, the more delayed speech and language can become. The ability to localize (and understand) sound requires two functioning ears. The brain uses input on the timing and loudness cues from both ears to determine where a sound is coming from and make sense of it. When this bilateral function is disrupted by a unilateral hearing loss, sound localization becomes extremely difficult. When children are in school, it is common for a teacher to walk around the classroom while instructing. For a child that cannot localize sound easily, this can have an impact on school performance. Similar to sound localization, the ability to distinguish speech within the presence of background noise requires two functioning ears. 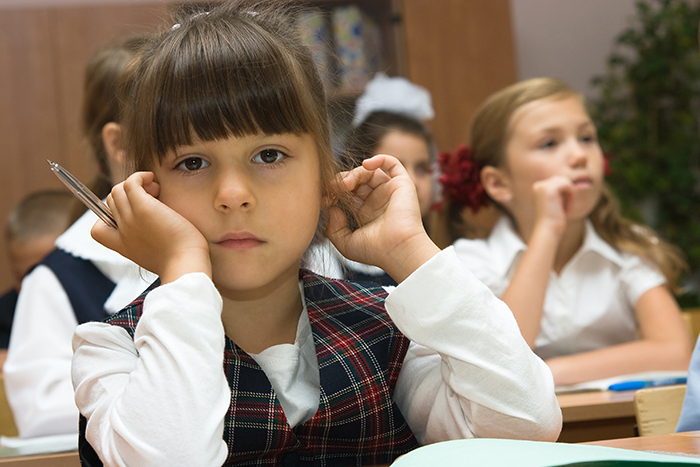 Classrooms are notoriously loud environments which can make it extremely difficult for this child to hear easily, perform well, and follow directions. Hearing loss causes delayed processing of information. When there is a hearing loss present, it takes a longer time for the brain to gather the sound and fill in the gaps to try to discern the message. This will make it very difficult for a child in a classroom who is required to multi-task by listening to the teacher and taking notes (all while in a noisy classroom!). A lot of success has been shown by fitting children who have a unilateral hearing loss with a hearing aid or CRO​S device. FM Systems should also be implemented in the classrooms which improve the signal-to-noise ratio and can provide direct input of speech into the child’s ear. If your child has shown difficulty in any of the areas above, schedule and​ appointment for a hearing test with our pediatric a​udiologists.